DURAGADGET 14 inch Padded Camera Rucksack Backpack Bag for Canon EOS and PowerShot Range – Now with Rain Cover! This bag features an adjustable velcro multi-section divider system that allows for many configurations. Ample external pockets allow quick zippered access to supplies, in additon to a water bottle pocket / adjustable tripod loops. Twin Back / Shoulder straps are fully adjustable and are padded for user comfort. Introducing DURAGADGET‘s new hardwearing rucksack for your expensive digital SLR camera, suitable for Canon EOS & PowerShot range SLR’s. Featuring a soft, padded, water-restistant lining and durable nylon outer shell, this case will provide maximum protection for your device. The newly added rain cover will protect your camera and all your accessories inside the bag should the weather turn sour! The dual zip closure on both the main compartment and the front pocket lends extra security and ensures your device is kept dust and scratch free. With fully adjustable shoulder straps which are padded for comfort and an additional carrying handle, the case provides added versatility and choice in the transportation of your SLR. A generous back pocket and multiple inner netted zip compartments allow you the option of keeping your accessories and memory requirements close by at all times, whilst the inside of the case includes a customisable velcro divider to suit your personal needs perfectly. Your SLR camera will be firmly held in place by an elasticised velcro stap for added security. May also be suitable for other SLR’s, please check against the following dimenions. Interior Dimensions: 30cm x 25cm x 10cm. 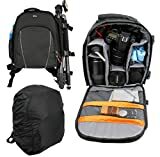 Posts related to DURAGADGET 14 inch Padded Camera Rucksack Backpack Bag for Canon EOS and PowerShot Range - Now with Rain Cover! This entry was posted in Discount Photography and tagged Backpack, Camera, Canon, Cover, DURAGADGET, inch, Padded, PowerShot, Rain, Range, Rucksack by Ball Photo. Bookmark the permalink.